Tonojima cucumber » Tsuruoka, Japan a Creative City of Gastronomy To Become a "Utopia of Food"
The Tonojima cucumber is cultivated in the Tonojima area of Tsuruoka. It is one of the “indigenous crops” that have been carefully preserved by farmers in limited areas around Tsuruoka city since the Edo Period (1603-1868). Although it seems only a handful of farmers cultivate the vegetable more recently, it was once so popular in Tsuruoka that Tonojima cucumber was a general synonym of cucumber. On a fine May 23th, we visited Mr. Ueno for an interview. As he told me when making the appointment, “farmers are busy around this time of the year.” He was no exception working hard to ship out spinach at a workplace right next to his home as we visited him. He was so kind to accept our interview in spite of this busy season. Mr. Ueno’s memories of Tonojima cucumber date back to when he was an elementary school student. 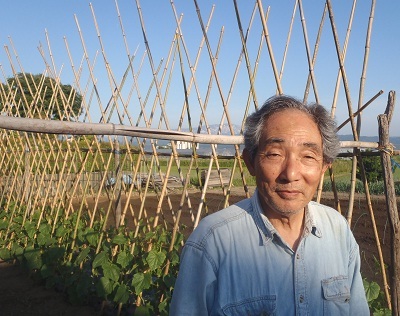 He has been together with Tonojima cucumber for more or less 65 years. “Continuing is not so easy.” smiles Mr. Ueno. 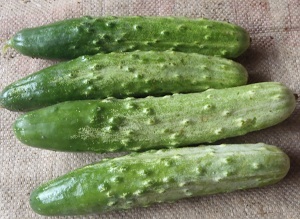 Tonojima cucumber is weaker against heat and diseases and has a smaller yield and a unique bitter taste compared to general cucumbers. For those reasons, the number of farmers gradually decreased, and Mr. Ueno was the only Tonojima cucumber farmer left. At last, he also decided to quit cultivating it 7 or 8 years ago. Fortunately, however, a local Japanese pickles shop requested him to keep cultivating Tonojima cucumber for their pickle products, resulting in the current three Tonojima cucumber farmers, including Mr. Ueno, who have restarted production as contract farmers. 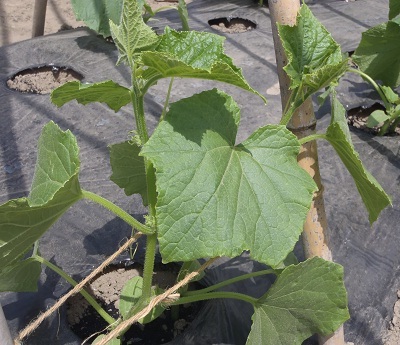 Growing as high as three meters with supports against the strong winds typical of the Shonai region, Tonojima cucumber is vulnerable to wind and falls easily. Due to that fact, the yield was very poor last year. 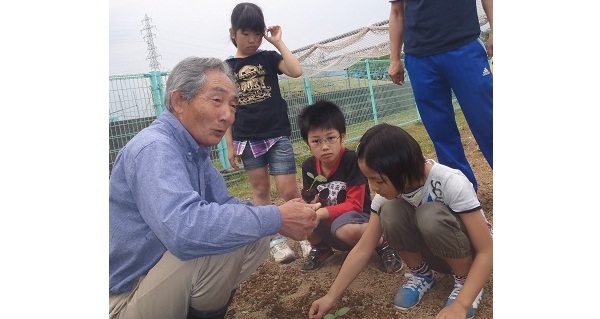 Mr. Ueno has many opportunities to be introduced on various media, including the film titled “Reviving Recipe.” He appears in the media with the hope that the number of Tonojima cucumber farmers will increase even a little. We learned that continuing Tonojima cucumber cultivation involves a lot of hard work, so why does Mr. Ueno keep doing it? Although Tonojima cucumber is currently not on sale frequently, it seems to bring back elderly people’s memories and make them happy when Mr. Ueno shares the cucumbers with them, he says. 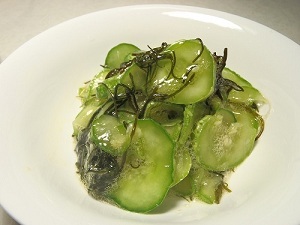 A recommended recipe for Tonojima cucumber is “namasu” (a dish consisting mainly of vegetables seasoned with vinegar) with local mozuku seaweed. The local mozuku has a firm texture and the crunchy cucumbers are a good match. The story told by Mr. Ueno, who has thorough knowledge of Tonojima cucumber, really makes my mouth water. We definitely need to try it this summer. 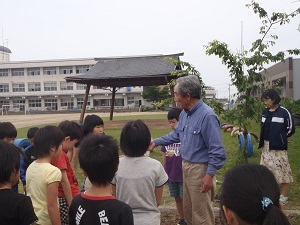 A few days later, we visited Itsuki Elementary School to see Mr. Ueno again, who taught a class on cultivating Tonojima cucumber to third graders. It was his fourth year teaching at the school. 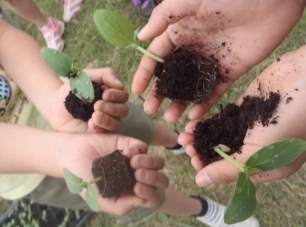 On that day, they transplanted the seedlings of Tonojima cucumber sown in early May to the garden in the school yard. “Have you ever eaten Tonojima cucumber?” When we asked them, only about a half of the students answered that they have eaten it. We envy the students who can cultivate and eat Tonojima cucumber, which is rarely distributed to markets even in Tsuruoka City. Mr. Ueno hopes that the students, who can actually buy anything at grocery stores, will have more experiences making what we traditionally have in our community, including growing crops from seeds and obtaining seeds from the crops. What do the students learn through this class?